Increased flows in the San Joaquin River, part of the San Joaquin River Restoration Program, are designed to help restore fish populations. However, increased seepage losses could result from these higher restoration flows, which could exacerbate existing drainage problems in neighboring agricultural lands and potentially damage crops. Channel deposits of abandoned river meanders that are hydraulically connected to the river could act as seepage conduits, allowing rapid and widespread water-table rise during restoration flows. There is a need to identify the geometry and properties of these channel deposits to assess their role in potential increased seepage effects and to evaluate management alternatives for reducing seepage. Electrical and electromagnetic surface geophysical methods have provided a reliable proxy for lithology in studies of fluvial and hyporheic systems where a sufficient electrical contrast exists between deposits of differing grain size. In this study, direct-current (DC) resistivity was used to measure subsurface resistivity to identify channel deposits and to map their subsurface geometry. 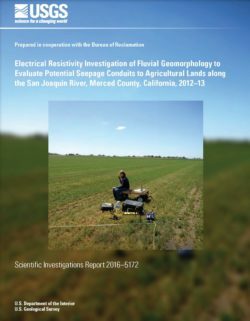 The efficacy of this method was assessed by using DC resistivity surveys collected along a short reach of the San Joaquin River in Merced County, California, during the summers of 2012 and 2013, in conjunction with borings and associated measurements from a hydraulic profiling tool. Modeled DC resistivity data corresponded with data from analyses of core samples, hand-auger samples, a hydraulic profiling tool, and aerial photographs, confirming that DC resistivity was effective for differentiating between silty and sandy deposits in this setting. Modeled DC resistivity data provided detailed two-dimensional cross-sectional resistivity profiles to a depth of about 20 meters. The distribution of high-resistivity units in these profiles was used as a proxy for identifying areas of high hydraulic conductivity. Estimates of the cross-sectional area of channel deposits from DC resistivity pseudosections can provide critical input for groundwater-flow models designed to simulate river seepage and evaluate seepage-management alternatives. In 2009, the U.S. Geological Survey, in cooperation with the city of Needles, began a study of the hydrogeology along the All-American Canal, which conveys water from the Colorado River to the Imperial Valley. The focus of this study was to gain a better understanding of the effect of lining the All-American Canal, and other management actions, on future total dissolved solids concentrations in groundwater pumped by Lower Colorado Water Supply Project wells that is delivered to the All-American Canal. 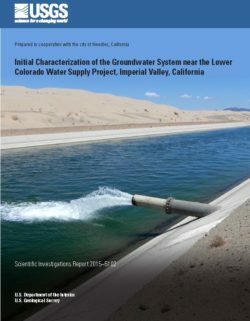 The study included the compilation and evaluation of previously published hydrogeologic and geochemical information, establishment of a groundwater-elevation and groundwater-quality monitoring network, results of monitoring groundwater elevations and groundwater quality from 2009 to 2011, site-specific hydrologic investigations of the Lower Colorado Water Supply Project area, examination of groundwater salinity by depth by using time-domain electromagnetic surveys, and monitoring of groundwater-storage change by using microgravity methods. Prior to the completion of the All-American Canal in 1940, groundwater in the study area flowed from east to west, and groundwater was recharged primarily by underflow from the Colorado River Valley. After construction of the All-American Canal, groundwater elevations were altered in the study area as seepage of Colorado River water from the All-American Canal and other canals became the dominant recharge source. By 2005, groundwater elevations had increased by as much as 50–70 feet along the All-American Canal. Superimposed on the east-to-west groundwater gradient was groundwater movement away from the All-American Canal to the north and, most likely, to the south into Mexico. After lining the All-American Canal, from 2007 to 2010, groundwater elevations declined as seepage from the All-American Canal decreased. Between 2005 (the last complete groundwater-elevation survey prior to lining the All-American Canal) and 2011, groundwater elevations declined 20–40 feet along the All-American Canal and as much as 40–45 feet in the vicinity of Lower Colorado Water Supply Project pumping wells. Water-quality and isotope data were used to differentiate historically recharged groundwater from groundwater more recently recharged by seepage of Colorado River surface water from the All-American Canal. Prior to the completion of the All-American Canal in 1940, groundwater in the southern part of the study area was primarily sodium-chloride/sulfate type water that had relatively low total dissolved solids concentrations (500–820 milligrams per liter). During 2007–11, groundwater in the southern part of the study area, near the All-American Canal, ranged from sodium-chloride type water to mixed-cation-sulfate type water that had total dissolved solids concentrations generally less than 879 milligrams per liter. The stable-isotopic signature of groundwater near the All-American Canal sampled in 2009–11 indicated inputs of Colorado River water that had been affected by evaporation, and radioactive isotopes indicated that a substantial fraction of water had been recharged recently, within the past 60 years. This contrasted with historically recharged groundwater near the All-American Canal, which had higher sodium and chloride concentrations, and lower calcium and sulfate concentrations, than recent recharge from the All-American Canal. Groundwater at a distance from the All-American Canal, in the East Mesa, Algodones Dunes, Pilot Knob Mesa, and Cargo Muchacho Mountains piedmont, was found to have higher total dissolved solids concentrations (generally greater than 1,000 milligrams per liter) than recently recharged groundwater near the All-American Canal. Time-domain electromagnetic data indicated that low-salinity groundwater was present down to about 377 feet below land surface near the All-American Canal; groundwater salinity at depth increased with distance north from the All-American Canal. Groundwater several miles or more from the canal also did not contain tritium and had a residence time on the order of thousands to tens of thousands of years. The groundwater in the piedmont of the Cargo Muchacho Mountains had a distinctly light stable-isotopic signature indicative of recharge by runoff from local precipitation, whereas the stable isotopic signature of groundwater in the East Mesa and the Algodones Dunes indicated a mixture of local precipitation and historic Colorado River recharge sources. During and after lining the All-American Canal (2007–11), groundwater elevations in the Lower Colorado Water Supply Project area declined, while total dissolved solids concentrations remained relatively constant. The total dissolved solids concentrations in well LCWSP-2 ranged from 650 to 800 milligrams per liter during this study. Depth-specific water-quality and isotope sampling at well LCWSP-2 indicated the groundwater pumped from the deeper part of the screened interval (240–280 feet below land surface) contained a greater proportion of historical groundwater than the groundwater pumped from the shallower part of the screened interval (350–385 feet below land surface). Age-tracer data at well LCWSP-2 indicated that all depths of the screened interval had received recent recharge from seepage of Colorado River water from the All-American Canal. 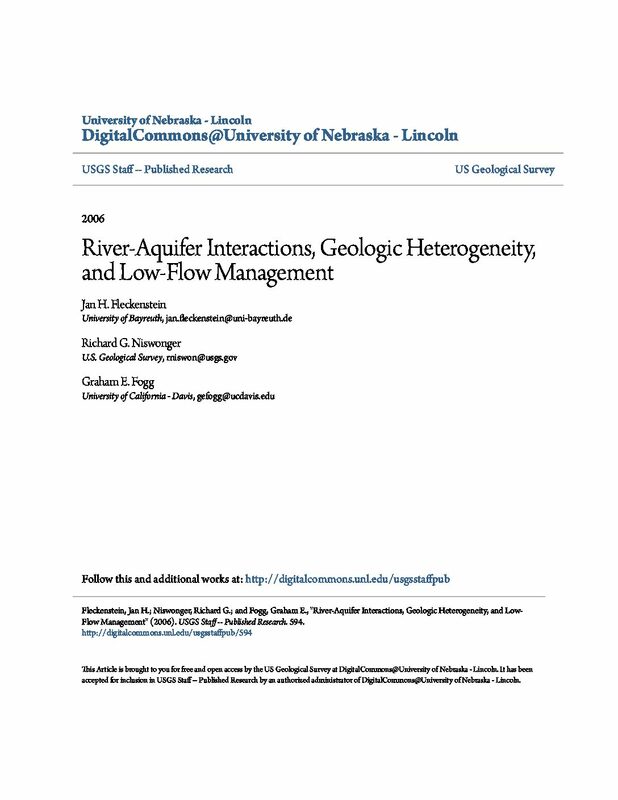 Low river flows are commonly controlled by river-aquifer exchange, the magnitude of which is governed by hydraulic properties of both aquifer and aquitard materials beneath the river. Low flows are often important ecologically. Numerical simulations were used to assess how textural heterogeneity of an alluvial system influences river seepage and low flows. The Cosumnes River in California was used as a test case. Declining fall flows in the Cosumnes River have threatened Chinook salmon runs. A ground water–surface water model for the lower river basin was developed, which incorporates detailed geostatistical simulations of aquifer heterogeneity. Six different realizations of heterogeneity and a homogenous model were run for a 3-year period. Net annual seepage from the river was found to be similar among the models. However, spatial distribution of seepage along the channel, water table configuration and the level of local connection, and disconnection between the river and aquifer showed strong variations among the different heterogeneous models. Most importantly, the heterogeneous models suggest that river seepage losses can be reduced by local reconnections, even when the regional water table remains well below the riverbed. The percentage of river channel responsible for 50% of total river seepage ranged from 10% to 26% in the heterogeneous models as opposed to 23% in the homogeneous model. Differences in seepage between the models resulted in up to 13 d difference in the number of days the river was open for salmon migration during the critical fall months in one given year.